Ever wondered what cartoon puke and snot would look like on a Refractor? Wonder no more. 2013 Topps Garbage Pail Kids Chrome Original Series 1 takes the cards that launched the brand and gives them the chromium treatment. Combining the classic set, Topps Chrome card stock and popular Refractor parallels, the set is a mix of old and new. The 2013 Topps Garbage Pail Kids Chrome Original Series 1 base set has 110 cards. The 41 original characters are redone in both their A and B versions for a total of 82 cards. 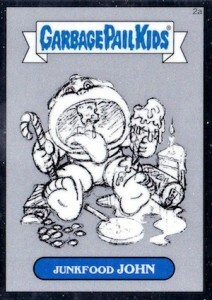 Fourteen Lost GPK cards have unpublished characters that didn't make the original cut. Like the main cards, each has an A and B version in classic Garbage Pail Kids fashion. Further delving into the franchise's history are 41 Concept Sketch inserts. Inserted 1:6 packs, they showcase early GPK artwork from John Pound. Refractors have long been one of the most recognizable inserts in the sports card realm. 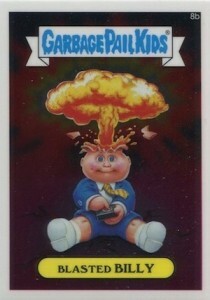 They lead the chase in 2013 Topps Garbage Pail Kids Chrome Original Series 1. Basic Refractors, which have a distinct rainbow shimmer background, parallel the base set. They fall 1:3 packs. Other Refractor versions include Prism, Gold and SuperFractor (1/1). Gold Refractors are only available in hobby packs. Although not numbered, Topps did say they were limited to 50 copies each. Atomic Refractors can be found in retail packs. There are also Printing Plates. 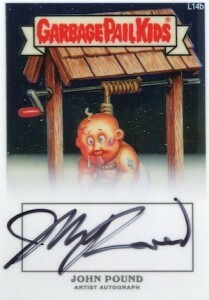 Artist Autographs deliver signatures from original GPK artist John Pound. He has signed 1,100 cards across the entire print run. Also randomly inserted are 50 prize redemptions good for things like uncut sheets from the first-ever set of Garbage Pail Kids. 110 cards - 41 A & B Originals and 14 A & B Lost GPK. Shop for base sets on eBay. The following is a tentative list as these were not included on the Topps checklist. We'll add more as they surface. Click here for a visual guide. How s****y they are not using the original banner, they can be printed with gold for all i care, another flashbacks crappy set. Can not find examples of refractor cards anywhere! What are the differences between prism, super, and basic?! I have some that look different from others. JAC � Refractors look great, but they’re sometimes tough to show in pictures. Basic refractors have a rainbow appearance in the background when you tilt them in light. It’s very bright. Prism Refractors have a ripple in the background. Atomic Refractors are like shards. Gold Refractors have a gold border. Superfractors are gold on the surface with circles and numbered 1/1 on the back. Is it even possible to get this WHOLE set with all there is to collect? I have a blank printing plate of spacey stacy 13b. Is this rare?